Investing in rechargeable batteries to use in your gadgets and tools is a smart decision that will save money and keep scores of disposable single-use batteries out of landfills and recycling centers. But choosing the right batteries to invest in isn’t easy. Lucky for you, we’re here to help. After hours of research and a week of preparation and testing, the best rechargeable AA batteries are Panasonic’s Eneloop Pro (available at Amazon for $26.30), as they outperformed seven different batteries. While they are the more expensive than anything else we tested, they will more than pay for themselves with additional years of excellent service. 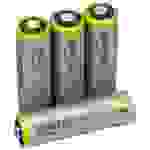 Note: For this roundup, we focused on AA batteries because they are the most commonly used, but it's a fairly safe bet that if you're looking for other sizes, these brands will also be your top choices (we'll address that more in our What You Should Know section at the bottom of this report). Panasonic’s Eneloop Pro AA Rechargeable Batteries, which can be purchased in packs of four, eight, or bought with a charge, provided close to an additional hour of use during our tests than its closest competitor, the AmazonBasics AA High Capacity Rechargeable Batteries. Eneloop Pro AA batteries have a 2550 mAh rating and can be charged 500 times before they lose the ability to hold a full charge. That doesn’t sound great when compared to batteries like the Energizer Recharge Universal or the AA cells made by RayHom, which offer recharge cycles of 1000 and 1200. But all high-capacity nickel metal hydride (NiMH) batteries come with a lower number of charge cycles than batteries with a lower mAh rating do. This is fine because they run longer than batteries with a lower mAh rating. That means you’ll need to charge them less frequently. Like all of the rechargeable batteries in this guide, the Eneloop Pro came pre-charged and ready to use. When not in use, they can maintain 85 percent of their full charge for up to a year at a time. This makes them a great option for an emergency preparedness kit. You can also buy these batteries at many brick-and-mortar stores around the country. You should know that they don’t come cheap. When bought in a pack of four, you’ll pay a few dollars per battery. This sounds like a lot of money, but when you consider how much cash you’ll save on disposable batteries over the lifetime of the Eneloop Pros, it becomes clear that these things are a great deal. If our top pick is outside your budget, check out the Amazon Basics Rechargeable AA Batteries. They are less than half the price of the Panasonic’s Eneloop Pro AA batteries, but you get what you pay for. The AmazonBasics AA batteries powered one of our test fans for eight hours and 20 minutes. Compared to the Eneloop Pro’s 10-hour and 45-minute runtime, that's not great. You’ll need to recharge them more often, making them a drag to use with high-drain items. Amazon claims they provide between 1900 and 2000 mAh and can be charged 1,000 times before they lose their capacity to hold a full charge. They’re not the best batteries that we tested—in fact, they came in fourth. But they do offer the best balance of price and performance. I’ve personally used them for years to power low-drain items like my keyboard and trackpad, so I feel comfortable, backed up by the data from our tests in recommending them to you. My name’s Seamus Bellamy. I’ve been working as a hardware journalist and reviewer for close to a decade. During my career, I’ve tested breathalyzers, tomahawks, space heaters and everything in between. I’ve been using rechargeable batteries in my work and for the gadgets I use in my personal life for years. I know how to gauge which ones will give you the most bang for your buck. The easiest way to test rechargeable batteries is to put them to work, head-to-head. So, after a little bit of prep work, that’s what I did. 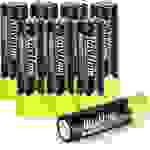 All of the rechargeable AA NiMH batteries in this guide came pre-charged and ready to use. However, there was no way to know how long they were sitting in a warehouse before being sent to me and, as such, no way to tell what state of charge they were in without running a few tests. I tested each set of batteries twice: once with a multimeter and again with the meter built into La Crosse’s BC700-CBP Alpha Power Battery Charger. As a way to spot any duds ahead of testing, I measured the mAh rating to see if they were consistent with what the labeling of each battery advertised. Then, I used the La Crosse charger to completely discharge and recharge each set of batteries three times to ensure the batteries would be fully charged and to make sure they were also capable of taking a consistent charge after they drained. Once confident the batteries were in good shape, I ran each set into the ground by using them to power the same device—a battery-powered personal fan (four identical Honeywell HTF090B Turbo on the Go Personal Fans). 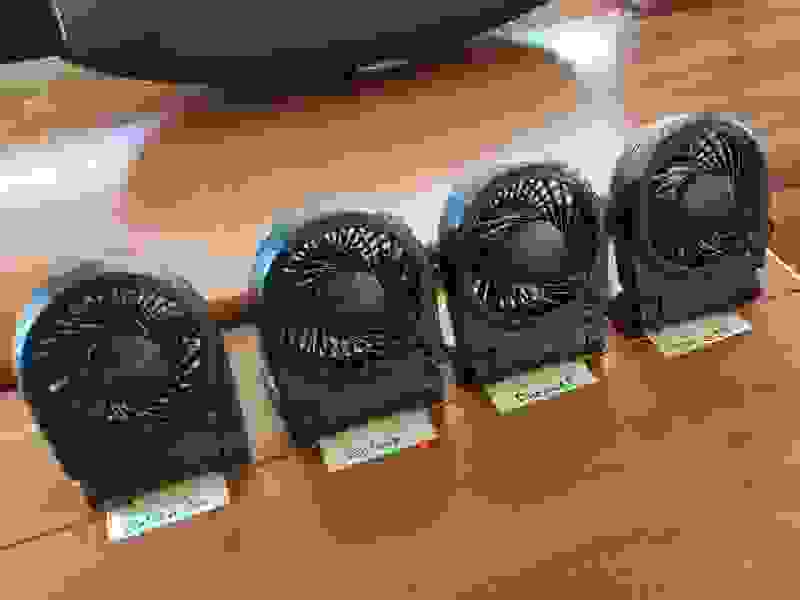 Noting the time that each fan was turned on, I let them run until the batteries inside were completely depleted. To calculate how long the batteries would last, fans were left running until each battery died. When the blades stopped turning, the time was noted and the test was stopped. In instances where I had to step away from observing the test, I set up a GoPro camera to record the operation of the fans, just in case one stopped running before I got back. At first glance, the AmazonBasics High Capacity Rechargeable Batteries look like a better buy than the Panasonic’s Eneloop Pro batteries. Both allow for 500 recharge cycles, can be stored for a year with minimal impact on their charge level, and like any NiMH battery, perform in colder temperatures. The only material difference between the two is their mAh ratings. The Eneloop Pro batteries are rated at 2550 mAh, where the AmazonBasics batteries are rated at 2400 mAh. During testing, the AmazonBasics High Capacity batteries ran one of my fans for nine hours and 45 minutes. This put them in second place behind the Eneloop Pro’s 10-hour and 45-minute runtime. Here’s where it gets tricky: For the additional cash per battery that you're paying for the Eneloop Pro, you're only getting an additional hour and 10 minutes of power per charge. So, the AmazonBasics High Capacity batteries were almost our top pick—but only getting an hour and change more in battery life for an extra couple of dollars? Fuggetaboutit. But here’s the thing: the additional 70 minutes per charge translates into an additional 350 extra hours of runtime during their 500-cycle lifespan over what Amazon can manage. That’s huge. 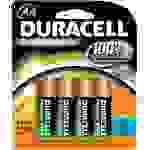 These 2450 mAh Duracell rechargeable batteries provided the third longest runtime—nine hours and 33 minutes. I like that they’re available most anywhere, hardware stores, supermarkets, you name it. I hate that they come with a 400 recharge cycle ceiling—100 cycles less than the Eneloop Pro. Also, when bought in a four pack, they have a higher per-battery cost than the AmazonBasics High Capacity batteries. 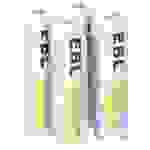 Unless you can’t find a set of Eneloop Pro or can’t wait for Amazon to send you a set of their High Capacity batteries, you should take a pass on them. When bought in a set of four, the Energizer Recharge Universal only cost a few cents more than the per battery cost of a set of our value pick, the AmazonBasics rechargeable batteries. With their 2,000 mAh capacity, they’re not considered to be high-performance cells, just like our 1900 mAh value pick. During testing, the Energizer batteries had eight hours and 17 minutes of runtime: three minutes less than our value pick could muster. 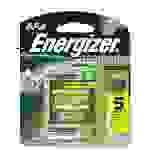 In short, these Energizer batteries are just a little too expensive and a little too underpowered to impress me. Given how well Panasonic’s Eneloop Pro performed, I was surprised that their lower capacity 2000 mAh siblings did so poorly. With a runtime of eight hours and two minutes and a price comparable to the longer lasting Duracell Rechargeable batteries, these batteries also had a runtime on the test fan that was 90 minutes shorter than those same Duracell batteries. I liked the idea of a dark horse battery manufacturer being able to go blow-for-blow, or even beat the AmazonBasics and Eneloop Pros of the world. If there’s a little-known brand out there that can swing it, this ain’t it. These EBL AA Rechargeable batteries were labeled as 2800 mAh, but, even after charging and refreshing them, were shown to have an actual mAh capacity of almost 400 mAh less. Rechargeable batteries will always show some variance in capacity, but not to this extent. Performance was lackluster as well, as they were only able to power one of our test fans for seven hours and 38 minutes. RayHom is another, lesser-known company that I had hoped would do well. They have a lower per battery cost than most of the other products I tested; they would be an outstanding value if they performed well, but they don't. They only lasted five hours and 25 minutes during testing. I actually charged the batteries a second time, just to make sure I hadn’t somehow fudged the first test, but came back with similar results. I promise you, despite their low price, you’ll be happier with either of our recommended picks than with these. 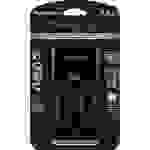 You’re gonna need a charger: Without a charger, any rechargeable batteries that you buy will be, well, just batteries. While it’s possible to get a deal on a set of batteries and a charger (in one package), I recommend picking up this BC700-CBP Alpha Power Battery Charger from La Crosse. It’ll provide you with all of the options you’ll need to get the best performance out of your rechargeable AA and AAA batteries. All batteries were completely charged before testing began. High Capacity: A high capacity rechargeable battery is simply one that boasts a higher-than-typical mAh rating. Theoretically, a high capacity battery should last longer in use than a standard battery will. However, as our tests illustrated, this isn't always the case. Using high capacity batteries means not having to swap them out for another set or recharging them as often as you would with regular capacity batteries. High capacity batteries also have fewer recharge cycles than regular capacity batteries. NiHM: Nickel Metal Hydride (NiMH, or Ni-MH) batteries are the most common kind of rechargeable batteries in AA, AAA, C and D sizes. Unlike older Nickel Cadmium (Ni-Cad) rechargeable batteries, NiMH batteries don’t have a “memory.” This means that they won’t lose any capacity if you opt to charge them before they are fully discharged. Modern NiMH batteries are capable of maintaining up to 85 percent of their full charge over the course of a year. mAh: mAh, or milliampere hours, is a measurement of electrical discharge. The higher the discharge amount, the longer the battery should last. But here's the thing: not all devices use the same amount of power. This is the main reason why we’ve tested all the batteries in this roundup rather than relying on their labeled mAh rating, as we wouldn't get the whole story otherwise. What’s more, the mAH rating on the label of some batteries may not reflect their actual mAh range. Recharge Cycles: The number of times a battery can be completely discharged and recharged before its capacity falls below 85 percent of the number of milliampere hours it was able to provide when it was new. This means that should you exceed the number of recharge cycles, you’ll still be able to use them, they just won’t provide as much runtime as they once did. Batteries with higher mAh ratings tend to have shorter recharge cycles compared to cells with lower mAh ratings. 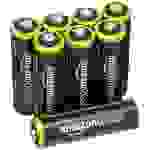 Other sizes and adapters: I focused on rechargeable AA batteries for this guide as they are, by far, the most commonly used battery size. They can also be used to power devices that require C- and D-size batteries, too. All you have to do is pop them into an appropriately-sized adapter and you’re in business. This adapter set from Eneloop is a great option for anyone interested in doing this.